Definition at line 24 of file CLSODA.h. Definition at line 95 of file CLSODA.cpp. 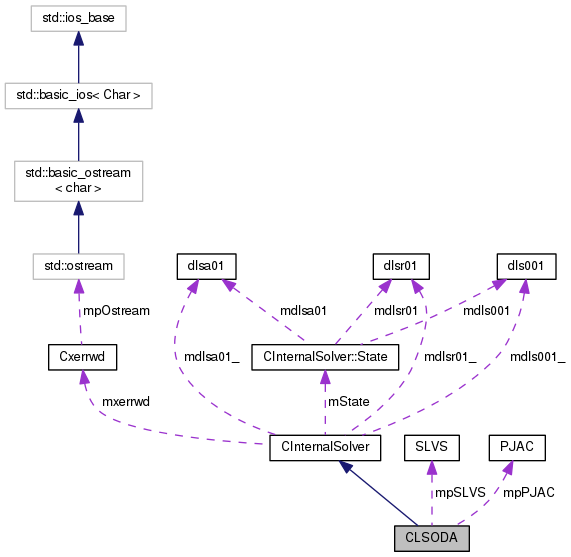 References CInternalSolver::dprja_(), CInternalSolver::dsolsy_(), mpPJAC, and mpSLVS. Definition at line 104 of file CLSODA.cpp. Definition at line 119 of file CLSODA.cpp. References c__0, c__1, c__10, c__101, c__102, c__103, c__104, c__105, c__106, c__107, c__11, c__12, c__13, c__14, c__15, c__16, c__17, c__18, c__19, c__2, c__20, c__201, c__202, c__203, c__204, c__205, c__206, c__207, c__21, c__22, c__23, c__24, c__25, c__26, c__27, c__28, c__29, c__3, c__30, c__303, c__4, c__40, c__5, c__50, c__6, c__60, c__7, c__8, c__9, c_b76, C_INT, d_sign(), dewset_(), CInternalSolver::dintdy_(), dls001_1, dlsa01_1, dmnorm_(), CInternalSolver::dstoda_(), if(), max, min, mord, mpPJAC, mpSLVS, CInternalSolver::mxerrwd, mxhnl0, and mxstp0. Definition at line 54 of file CLSODA.h. Definition at line 49 of file CLSODA.h. Referenced by CLSODA(), operator()(), and ~CLSODA(). Definition at line 50 of file CLSODA.h. Definition at line 53 of file CLSODA.h. Definition at line 52 of file CLSODA.h.